Peter Young took this photo from Boston Manor Road, near Brentford Central Station, on 28th June 1972, a blue-sky summer's day. 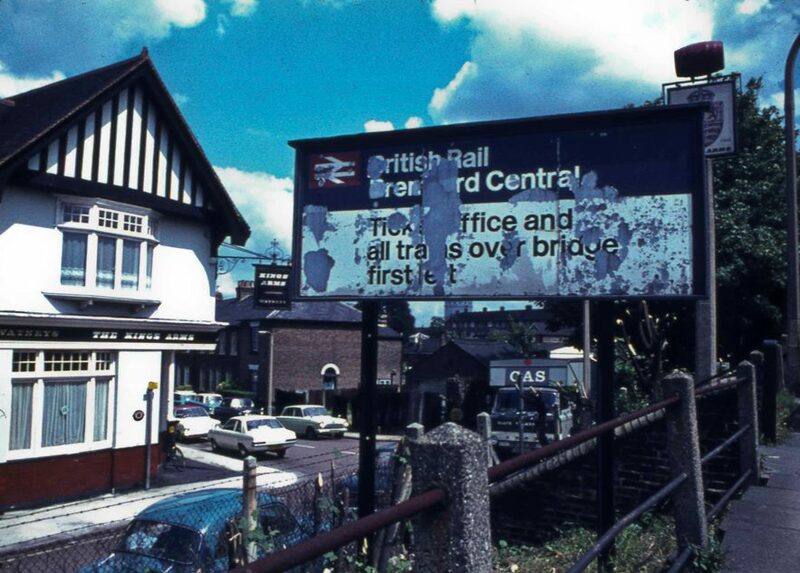 It takes in the British Rail signage, showing signs of age, and also the Kings Arms pub on the corner of Orchard Road and Station Road or Boston (Manor) Road, a Watney's pub at the time. Google Street View (October 2016) shows a very similar view but the pub looks smarter, the brickwork under the windows no longer painted burgundy/brown (ofcourse men wore brown suits at the time) but now resplendent in 'Bleu de France' or maybe 'Steel Blue'. Its address is 19 Boston Manor Road. Since 1980 the station has been simply 'Brentford Station'.